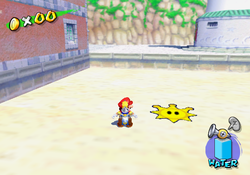 Shine Sprite in the Sand, also called Beach Combing, Sand Art, and Beach-Combing for Treasure, is a mission in Delfino Plaza in Super Mario Sunshine. It can be completed at any point, aside during when Delfino Plaza is flooded, and requires the player to go to the beach next to the lighthouse and the Gelato Beach entrance. An image of a Shine Sprite is hidden in the sand, near the lighthouse and a house with some open windows. The image can only be revealed by Mario spraying the area with water until it fully forms. Once the image is fully visible, a physical Shine Sprite appears and flies away to a pillar jutting out of the ocean. Mario must then jump across the platforms to the Shine Sprite to obtain it. As a side note, if a glitch is used to walk underwater during the flood, a different Shine Sprite marker can be found closer to the umbrellas on the same beach, but only gives out a coin. ↑ Averill, Alan, and Jennifer Villareal. Super Mario Sunshine Official Nintendo Player's Guide, page 24. ↑ Hodgson, David S J, Bryan Stratton, and Stephen Stratton. Super Mario Sunshine Prima Official Strategy Guide, page 33. ↑ Bogenn, Tim, and Doug Walsh. Super Mario Sunshine BradyGames Official Strategy Guide, page 149. ↑ Loe, Casey. Super Mario Sunshine Versus Books Perfect Guide, page 24. This page was last edited on February 19, 2018, at 12:01.